Elvis has not left the building at the Wishbone on Federal. This is a great place to eat in Westminster, specializing in old-fashioned fried chicken. Next time I go I want to remember to order the chicken livers. I haven’t had fried chicken livers since I was in Maple Hill, Kansas, and that’s a whole nother story. Anytime we go to Wishbone for chicken, it’s special. 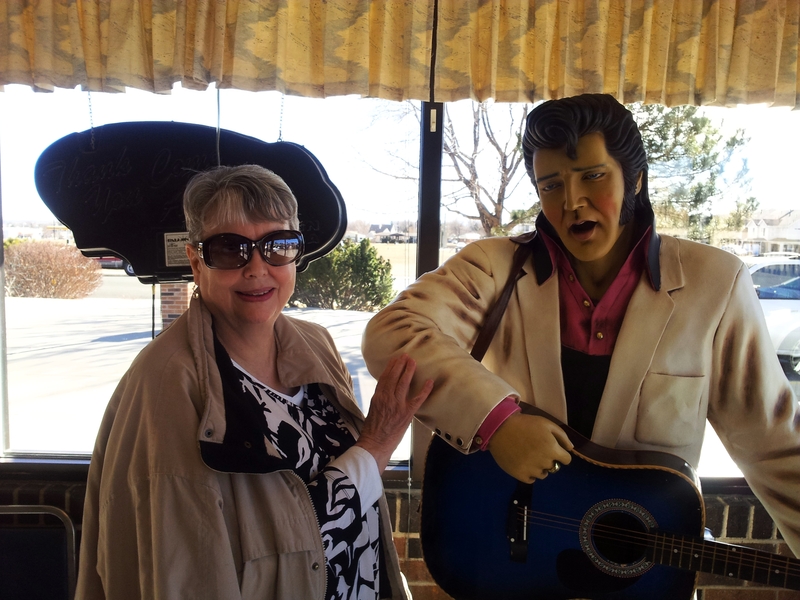 Elvis will let you take your picture with him. The first time I heard a shofar in person was many years ago at the Tabernacle exhibit at the “Holyland Experience” in Orland, Florida. My husband and I had so much fun there. What a wonderful place. Now we attend a Messianic church which has several shofar blowers and we open every service with the shofar call to worship and then sing The Shema. 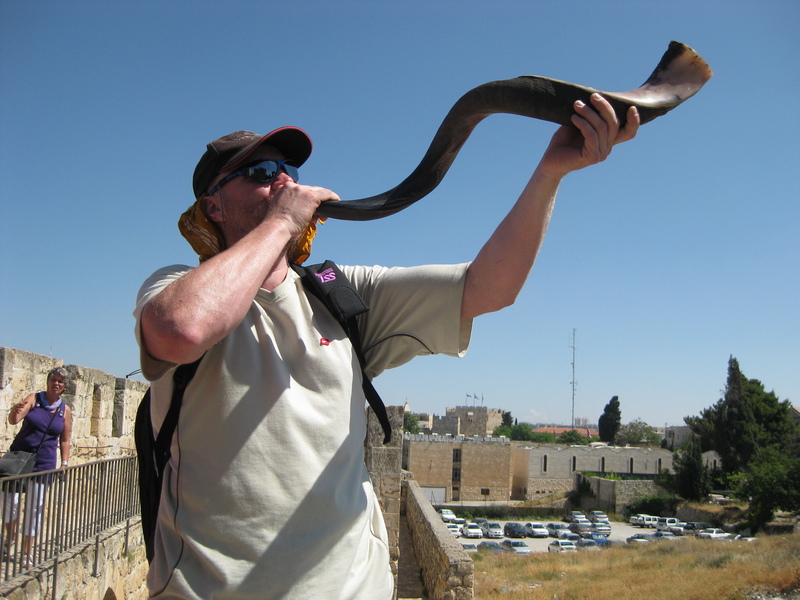 The shofar become very special in my heart, and to hear the shofar blown on the ramparts over Jerusalem brought me joy that lasts until this very day as I continue to pray for the peace of Jerusalem. You can read more about it in my book, On Our Own In Jerusalem. Today is the last day to enter my giveaway here at Vicki Andree Books. The prize awarded to the winner will be a copy of the Daily Light Journal by Anne Graham Lotz. This edition is leather bound with gold trim. 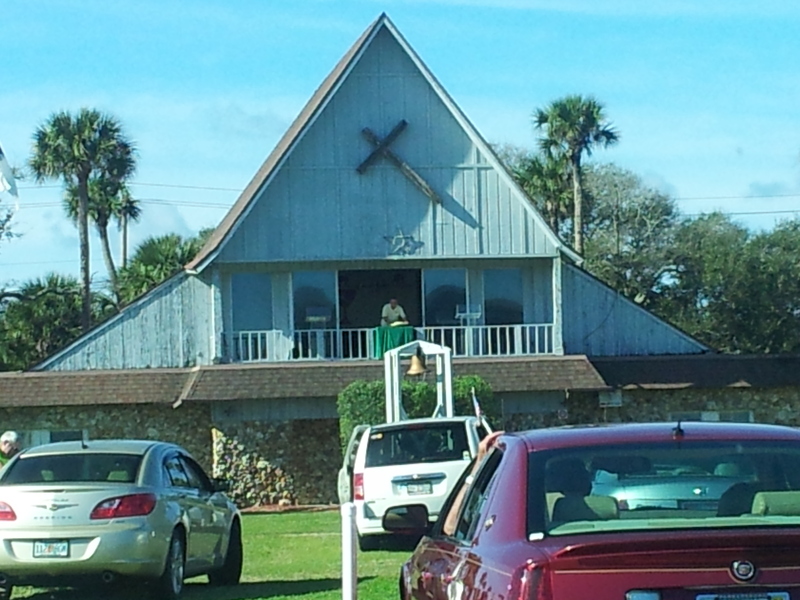 When I’m in Dayton Beach, David takes me to the drive in church there. This church is unique in that it is a blast from the past when you find yourself driving into what used to be a drive-in theater. I remember my father loading up the family for a night at the drive-in. The huge screen in front of us started showing pictures at sunset. The picture got better as the last rays of the sun disappeared. At intermission we would break out the popcorn we brought and watch people amble over to the concession building. Those days have been gone for a long time. I will say that it’s very weird to go to the drive-in in the morning for church. 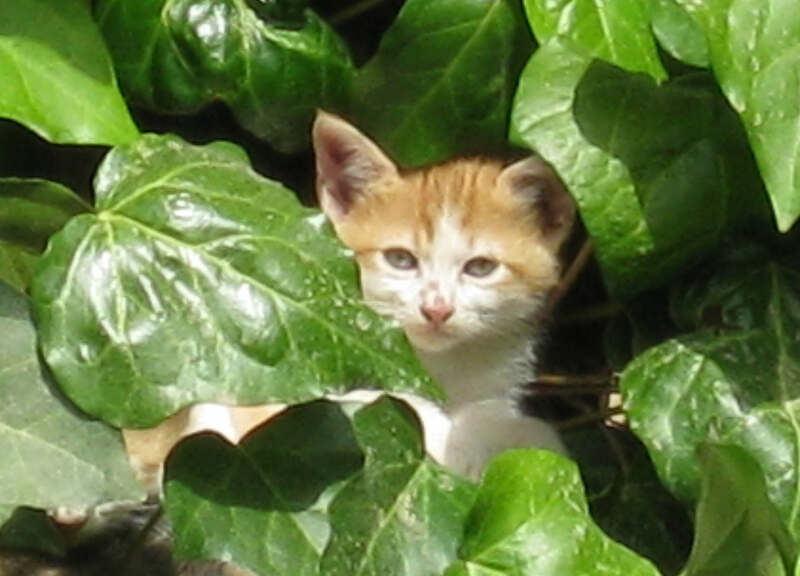 Once you find the perfect spot, you tune into a radio frequency to hear the message. Every time we’ve attended I have been blessed.